An interactive artwork on display at the TATE Modern museum in London was put up by Church members Matthew Hunt and Stefan Rossbach. The display was part of the TATE Exchange initiative, which enables TATE to invite external organisations and individuals to display work on Level 5 of the new extension, the Blavatnik building. 2016/17 was the inaugural year of this new initiative, and it had ‘Exchange’ as its overall theme. What will happen to the last person in the cage, just before the Museum closes for the day? Brother Hunt and Brother Rossbach designed and built a cage-like structure which worked in such a way that visitors who entered the cage could only get out again if someone else - another visitor - would enter the cage and take their place. The idea was to create an occasion for interesting encounters between strangers, who would exchange their ‘freedoms’ as one enters the cage in order to release the other. Over 4,000 visitors saw the display at TATE in April 2017, and hundreds of them went through the cage, learning that freedom is a collective achievement where people gain and maintain Brother Rossbach summarised the experience: “Our cage attracted a lot of attention. 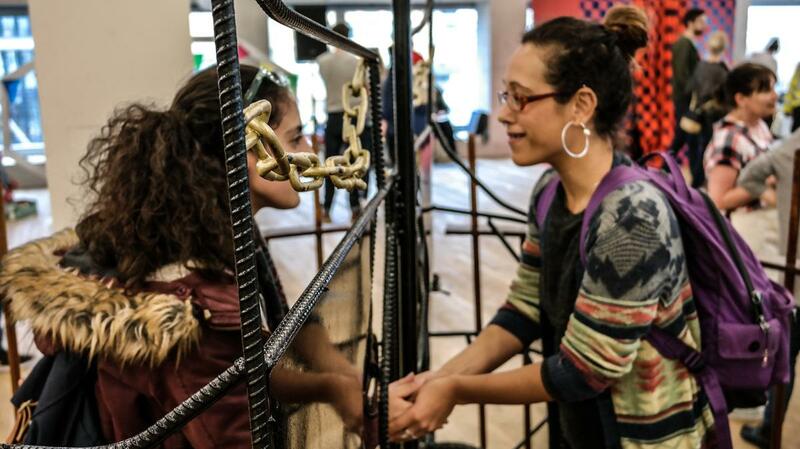 We witnessed many moving encounters between strangers, who fully understood and appreciated the dynamics of the cage. Those who were released would express their gratitude, shake hands with their liberators, and sometimes even exchange contact details! A typical question we were frequently asked was: What will happen to the last person in the cage, just before the Museum closes for the day? This, of course, was the key question. Who will bail everyone out at the end?